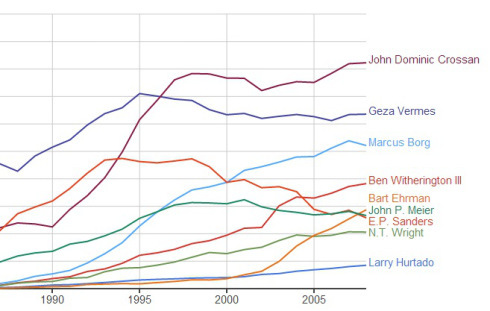 Check out this very insightful N-Gram on the relative popularity of a number of historical Jesus scholars over the past few decades. To my surprise, some of the more conservative scholars who I thought would be leading the race (e.g. N.T. Wright) are trailing behind. Conversely, with John Dominic Crossan clearly in the lead, this is a definite win for (implicit) Marxism in New Testament studies and in fact proves that Marxism is not just a fad! This is great, Jason! Excellent analysis. I’m a data scientist. Never expected to see such an article on here. I loved it. Is the data/code open source anywhere? I’d love to have a look at it. Text analytics is my specialty.